A few months ago I had the pleasure of working with a great blues artist, Adrianna Marie, on her Double Crossing Blues album. She's now nominated for Blues Music Awards Best New Artist. If you're a voting member, please consider voting for her. There are only two more days to vote as the voting will close on March 1st. Go here to vote. This is some great and authentic 40's blues, complete with the A team horn section of Lee Thornburg and Ron Dzuibla (between them they sound like a big band section), and my buddy LA Jones on his always excellent guitar (with the most authentic era sound you've ever heard). As many of you know, I cherry pick projects to produce these days, and this is one I'm proud to have worked on (mixed it too). 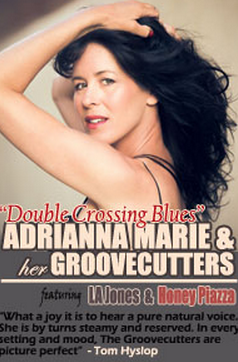 Check out Adrianna Marie and her Groovecutters site to hear some of here songs.